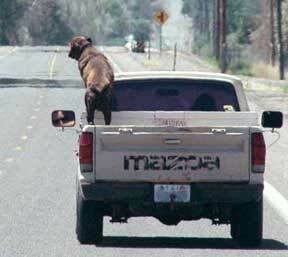 Watch for dogs riding dangerously in vehicles—loose in pickup truck beds or hanging out of open car windows. They can be injured by flying insects or road debris thrown up by opposing traffic, or they can be flung out of the vehicle during sudden accident avoidance measures with potentially catastrophic results. Talk with owners or drivers whenever you can. Is this a common sight in your neck of the woods? Take a good look. This dog is just one pothole away from an emergency vet clinic–or worse, he might not survive the fall. Should these drivers tie a leash to something in the bed? No, this is dangerous too. If thrown from the pickup bed by a bump or a swerve, the dog can be dragged behind the truck if the leash is long. If the leash is short, the dog could hang to his death, legs dragging. The driver might not even notice right away, especially if listening to loud music or talking on the phone. What about flying insects or road debris kicked up by opposing traffic? Is this dangerous? You know it is. Eyes and ears are especially vulnerable. If the dog has a pre-existing eye condition, even the wind can cause problems. If the driver stops for a burger and leaves his dog in the back? That’s an invitation to dog thieves. This happened in 2008 in Viroqua, Wisconsin. A family watched from inside McDonalds as their golden Labrador Retriever was lifted out of the pickup truck bed by a big man. They ran out, jumped back in the pickup and chased the thief for miles but lost him. This family notified authorities regionally about their missing dog and lodged a complaint with police, all to no avail. Luckily, the thief dumped the dog in a town 20 miles away two weeks later and the dog was picked up by animal control. The family was extremely grateful to have their beloved dog back safely, and vowed not to transport him so carelessly again. The only safe way to transport a dog in the back of a pickup truck is inside a correctly-sized (for the dog) solid-wall crate that is securely fastened to the floor of the bed, so that it can’t slide around or bounce out. Ventilation holes and view ports should be faced away from the wind to minimize risk from flying debris and insects. Use of a crate also helps to discourage would-be dog thieves because access isn’t as quick and easy. If you have opportunities to talk with people who transport dogs loose in the back of a pickup, please say something. You could save a life or prevent an accident.